Did a high schooler really hack the CIA director's personal email? A young hacker has reportedly managed to gain access to the personal email account of CIA Director John Brennan. Speaking to the New York Post, the hacker is reportedly under 20 years of age and a US school student and is working with a classmate and the duo are working under the name 'Crackas With Attitude'. They were reportedly motivated to hack Brennan's personal AOL email account in opposition to the US foreign policy regarding Palestine. According to the publication, they were able to gain access to the email account on October 12 by simply convincing AOL to reset the account's password. The mystery hacker had since been tweeting under the @_CWA_ account, and though that account has been shut down, he is currently tweeting via @phphax. It's still unclear if this hack is a hoax or not, but a tweet on the @phphax account shows a document with a list of names and what appears to be social security numbers that the hacker claims he obtained from Brennan's personal email account. The hacker claims he also has a number of government documents attached to about 40 different emails, including Brennan's 47-page application for top-secret security clearance, personal information of more than a dozen top American intelligence officers and a letter that describes interrogation techniques being used on terrorism suspects. 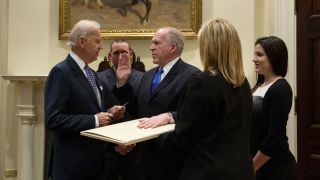 According to the publication, the CIA says that it is aware of the reports about the hack and it is referring "the matter to the appropriate authorities," but we assume questions on if Brennan has been using his personal email account for government-related communications will come up.